Bath Village Hall is located at 110 Liberty Street, Bath NY 14810; phone: 607-776-3811. There appears to be no residential property with access to the Cohocton River. Interstate 86 (Southern Tier Expressway, dominates the border along the northern shore of the river. Photo: George W. Hallock House (The Pillars), ca. 1847, 16 West William Street, Bath, NY. Listed on the National Register of Historic Places in 2004. Photographed by User:	Pubdog (own work), 2009, [cc-by-1.0 (creativecommons.org/publicdomain/zero/1.0/deed.en)], via Wikimedia Commons, accessed October, 2013. The village of Bath is located on the wide flood plain of the northern bank of the Cohocton River, a tributary of the Susquehanna River. It is surrounded by the rural, agricultural town of Bath in central Steuben County. The Cohocton River, which flows east towards the Susquehanna, had an important influence on Bath's early economic development as the major source of power and transportation. The village plan, designed by Thomas Rees, Jr. in 1794, provided for two open squares, Pulteney and St. Patrick's (now called Washington Park). They are connected by Liberty Street, the main north-south axis along which early commercial development occurred. Residential districts developed along secondary routes, including Morris Street (the southern boundary of Pulteney Square), Steuben Street (the northern boundary of the Square) and Gansevoort Street (parallel to and east of Liberty Street). Washington Street, also one of the first residential streets, is the major east-west route bisecting Washington Park. Pulteney Square became the focal point of the young community in the early nineteenth century; Washington Park never developed into Pulteney Square's northern complement as envisioned by the village's planners. The original plan of the village remains unchanged. The historic building stock of the village is comprised of a broad range of architectural styles popular during the nineteenth and early twentieth centuries. Styes of the second half of the nineteenth century predominate, reflecting Bath's most prosperous period. Romanesque Revival and Italianate style attached brick rows are most common in the commercial sections of the village. Residential areas contain Greek Revival, Italianate, Gothic Revival, Queen Anne and Colonial Revival style dwellings as well as transitional and eclectic examples of the various styles and periods. Bath's large, imposing civic buildings, including the Steuben County Courthouse, the County Clerk's Office, the Surrogate Office, the Municipal Building, Lyon Elementary School, and the U. S. Post Office, are designed in a broad range of styles from mid-nineteenth century Greek Revival to early twentieth century Colonial Revival. The two Gothic Revival style ecclesiastical structures, the First Presbyterian Church and the St. Thomas Episcopal Church, date from the 1860's. The properties included in the Bath Village Multiple Resource Area are architecturally and historically significant examples of commercial, residential, religious and civic architecture dating from c. 1820 to c. 1930. Distinctive examples of a broad range of styles, periods and types represent the growth of the village from its earliest prosperity as a riverfront trading center to its later prominence as the county seat of Steuben County and the center of commercial activity for the surrounding agricultural regions. The village contains two distinct architecturally distinguished districts: the Liberty Street Historic District, which encompasses the historic commercial and residential core of Bath and includes the village's most notable examples of civic and ecclesiastical architecture, and the Gansevoort/East Steuben Streets Historic District, significant as the only intact enclave of nineteenth-century middle-class residential architecture in the village. The village of Bath is also distinguished by several examples of the work of regionally or nationally prominent nineteenth-century architects — most notably the two Gothic Revival style churches within the Liberty Street Historic District designed by Jacob Wray Mould and Henry Dudley, both among New York State's most renowned church architects. Merwin Austin, well known for his work in Rochester with J. Foster Warner, designed several residences in Bath, and Daniel Badger's Architectural Iron Works Company of New York City is represented by the original cast-iron facade at 7 Liberty Street. The historic resources of Bath represent many significant episodes in the history of the village; taken together, they recall the distinctive architectural quality of a prosperous nineteenth-century village in the Finger Lakes Region of New York. In the late eighteenth century, an English land speculation company headed by Sir William Pulteney acquired a 1,200,000-acre tract of land in central New York State from American financier Robert Morris. Captain Charles Williamson, the company's first local agent, established a settlement on the northern bank of the Cohocton River. He named the settlement Bath after the Countess of Bath, England. Williamson believed that Bath, located at the headwaters of the Susquehanna River, would soon become a thriving riverside trading center through which goods from the west would reach the Atlantic via Baltimore. In 1792-1793, Pulteney Square was cleared in the wilderness where the land office of Capt. Williamson and the dwellings of the earliest settlers were erected. Land sales were extensive in the late eighteenth century and Bath became, for a short period, a commercial center supported by the river trade and funding from the English company. Mills, a school, a theater, a race track, a courthouse and a jail were erected under Williamson's supervision. While Pulteney Square became the focal point of the village's development, the commercial district spread north along Liberty Street and residential neighborhoods developed along side streets including Gansevoort, East Steuben and Washington Streets. Although Sir Pulteney withdrew the company's support of Bath in 1800, the young settlement survived. The completion of the Erie Canal in 1825 provided the major east-west transportation system which determined the development patterns of much of New York State. Although the Susquehanna River had been an important early nineteenth century transportation route for the export of lumber and grain, the new canal proved much more efficient, and much of the trade that had sustained Bath was diverted to the canal. Again, the village survived the loss of an important financial source and continued to grow at a gradual but steady rate. Distinctive examples of Greek Revival architecture dating from the 1830's reflect Bath's prosperity during the second quarter of the nineteenth century. Structures embodying the characteristics of the type, period and style include modest vernacular farmhouses, such as the McMaster House (207 East Washington Street ) and the Haverling Farmhouse (313 Haverling Street). 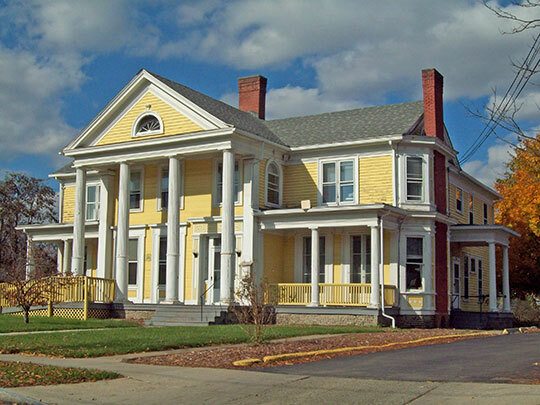 Middle-class Greek Revival style dwellings include the Balcom House (East Pulteney Square; now the Supervisor's Chambers and therefore an important component of the distinctive civic complex) in the Liberty Street Historic District, and the McMaster/Parkhurst House (101 East Steuben Street), the C. H. Young House (103 East Steuben Street), the Lewis Biles House (13 Gansevoort Street), and the Ten Eyck Gansevoort House (10 Gansevoort Street), all included in the East Steuben/Gansevoort Streets Historic District. Fashionable, high-style Greek Revival residences include the Reuben Robie House (16 West Washington Street) and the Cobblestone House (120 West Washington Street). Distinctive civic buildings designed in the Greek Revival style include the Steuben County Bank (West Pulteney Square), and the Steuben County Courthouse (East Pulteney Square), both included in the Liberty Street Historic District. The construction of the Buffalo, Corning & New York Railroad in 1853 precipitated Bath's most prosperous period of growth. The predominance in Bath of styles popular during the third quarter of the nineteenth century reflects this era of economic expansion. The most prominent commercial style dating from this period of prosperity is the Romanesque Revival. Distinctive examples of the style include the attached brick rows on both sides of Liberty Street between Pulteney Square and William Street. The rows were constructed after a series of fires in 1855, 1859 and 1862 leveled many of the earliest commercial buildings on the street. The few examples of Italianate style commercial architecture are also located in the Liberty Street Historic District, including, most notably, the Ambrose S. Howell Building (7 Liberty Street), which retains its original cast-iron facade as designed by Daniel Badger's Architectural Iron Works of New York City. Also notable among the Liberty Street commercial buildings of the period is the Purdy Opera House (43-45 Liberty Street), which, with its prominent tower and mansard roof, reflects the influence of the Second Empire style. Also dating from this prosperous era are the village's most distinctive ecclesiastical structures, the First Presbyterian Church and the St. Thomas Episcopal Church. Both are located in the Liberty Street Historic District. The architecturally distinguished Gothic Revival style structures were both designed by architects who have achieved statewide prominence. The First Presbyterian Church (South Pulteney Square), was designed by Jacob Wray Mould, a noted New York City ecclesiastical architect during the mid-nineteenth century. Notable churches designed by Mould include the All Saints Church in New York City and the Second Unitarian Church in Brooklyn. Particularly notable features of the First Presbyterian Church include the stained glass windows designed by the Louis Comfort Tiffany Studios. The St. Thomas Episcopal Church (122 Liberty Street) was designed by Henry W. Dudley, also a prominent New York City ecclesiastical architect. Dudley designed the Church of the Advent, Nashville, TN, the Christ Episcopal Church at New Brunswick, NJ, and St., Paul's Episcopal Church at Syracuse, NY. (National Register, 1978). Distinctive examples of residential architecture dating from the third quarter of the nineteenth century are included in both historic districts and are scattered throughout the village. Two Gothic Revival style cottages survive intact, embodying the picturesque ideals of the period and style. They are the Potter-Van Camp House (4 West Washington Street), included among the individual properties being nominated, and 226 Liberty Street, in the residential area of the Liberty Street Historic District. Significant examples of Italianate style dwellings include 11 Gansevoort Street in the Gansevoort/East Steuben Streets Historic District and 213 Liberty Street and the B. F. Young House (220 Liberty Street) in the Liberty Street Historic District. Some of the most distinctive and intact examples of the fashionable Italianate style dwellings located outside of the two districts include the Campbell-Rumsey House (225 East Steuben Street), the Sedgwick House (101 Haverling Street) and the H. W. Perine House (1 Haverling Street), designed by the prominent Rochester architect, Merwin Austin. Only two examples of the fashionable Italian Villa style survive in Bath. They are the A. P. Ferris House (209 Liberty Street), in the Liberty Street Historic District, and the William Shepherd House (110 West Washington Street), included as an individual component. Bath's development after 1880 is reflected in the variety of distinctive structures designed in the late Victorian styles. Most prominent are the Queen Anne style dwellings which are located in the Gansevoort/East Steuben Streets Historic District and the northern section of the Liberty Street Historic District. These include 111 East Steuben street, the Parker House (221 Liberty Street), the Jones House #1 (223 Liberty Street), and the Jones House #2 (225 Liberty Street). The Barber House (West Pulteney Square), is a particularly notable late nineteenth century eclectic dwelling. Late nineteenth century civic structures include the County Clerk's Office, a Romanesque Revival style building, and the Surrogate Office, an eclectic building exhibiting a variety of late nineteenth century architectural features. Significant late nineteenth century commercial structures are located on the north and south sides of Buell Street in the Liberty Street Historic District. The narrow street includes two hotels, a former harness factory and several commercial buildings constructed primarily for the service trades. These smaller-scaled, more modestly embellished buildings complement the larger, more ostentatiously decorated commercial structures on Liberty Street. The Davenport Estate Buildings are distinguished examples of estate-related outbuildings in Bath. These structures are the only surviving buildings of the Davenport Estate, Bath's most extensive nineteenth-century estate. Their designs embody the picturesque ideals of mid- to late-nineteenth century Victorian architecture. Their historical association with Davenport Estates recalls the late nineteenth century prosperity of the village. Significant early twentieth century architecture in Bath includes the Municipal Building, the U. S. Post Office and the Lyon Elementary School, all distinctive examples of Neoclassical style civic architecture. The large prominent structures are key visual elements in the Liberty Street Historic District. The Davenport Library, a mid-nineteenth century dwelling completely remodeled during the early 1900's in the Colonial Revival style, is associated with the prominent Davenport family and significant as an early twentieth century cultural and educational center. Child, Hamilton. Gazetteer and Business Directory of Steuben county N.Y. for 1868-69. Syracuse. 1868. Clayton, W. W. History of Steuben County, N. Y. Philadelphia. 1879. The Farm Journal Illustrated Rural Directory of Steuben County N. Y. New York. 1917. Gillette, J. E. A Topographical Map of Steuben County, N. Y. Philadelphia. 1857. Hakes, Harlo. Landmarks of Steuben County, N.Y. Syracuse. 1896. Levy, M. Surveyor. Atlas of Steuben County. Beers: 1873. McCall, James. Bath (New York). "An Address Delivered at the Sesquicentennial Celebration of the Village of Bath, N.Y.," July 12, 1943. McMaster, Guy. History of the Settlement of Steuben County, N.Y. Bath. 1853. Map of Bath. The Sanborn Map Company: 1888, 1893, 1898, 1904, 1915. Map of Bath, Steuben County, New York, Hoboken: Slator and Slator. 1854. Map of the Village of Bath. L. Cunningham, Surveyor. Philadelphia: M. S. Converse and G. M. Hopkins. 1869. Near, Irvin W. A History of Steuben County and Its People. Chicago. 1911. Roberts, Millard F. Historical Gazetteer of Steuben County, N. Y. Syracuse, 1891.